Last week, Punit Soni (Motorola’s VP of Product Management) told us that we were “days” away from the arrival of Developer Editions and other carrier models of the Moto X. Yesterday, Motorola updated their Moto X “ways to buy” page, showing off the new Developer Edition, which will sport a black front panel coupled with a white woven rear back plate. The render of the phone also shows the words “DEVELOPER EDITION” engraved on the bottom. The page mentions that the dev edition will “have a look all its own,” meaning the two-tone color scheme is something different than what you’ll find in carrier models. Now, once MotoMaker is fully opened up or should you buy a Moto X card from AT&T, you could essentially build a similar looking device. The listing also confirms 32GB of storage and an unlockable bootloader. 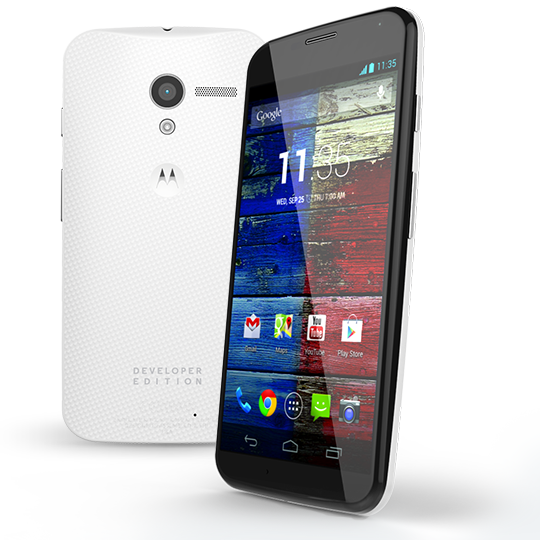 No price is listed just yet, but since the AT&T 32GB model runs $629, I’d be surprised if it was lower. We’ll be sure to let you know as soon as this model goes live. Also, Punit has said that this “ways to buy” page (linked below) is the best way to keep track of availability of the Moto X outside of AT&T.